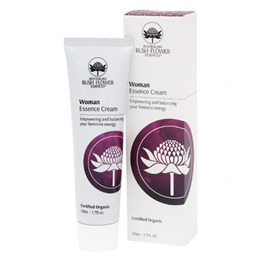 The woman moisturiser is a blend of exquisite essential oils, beautifully nurturing botanical butters, herbs and skin rebalancing Australian bush flower essences. Billy Goat Plum, Bottlebrush, Bush Fuchsia, Crowea, Five Corners, Mulla Mulla, Old Man Banksia, Peach-flowered Tea-tree, She Oak. Organic Aloe barbadensis leaf juice, Organic Simmondsia chinensis (Jojoba) seed oil, cetearyl alcohol, Organic glycerin, Organic Prunus amygdalus dulcis (Sweet almond) oil, glyceryl stearate citrate*, Coco-caprylate*, Organic Persea gratissima (Avocado) oil, glycerin*, Organic Rosa canina (Rosehip) fruit oil, Rosa damascena (Rose) flower oil, Lavandula angustifolia (Lavender) oil, Pelargonium graveolens (Geranium) flower oil, Citrus aurantium bergamia (Bergamot) fruit oil, Planchonia careya essence, Callistemon linearis essence, Epacris longiflora essence, Crowea saligna essence, Styphelia triflora essence, Ptilotus atripicifolius essence, Banksia serrata essence, Leptospermum squarrosum essence, Actinotus forsythii essence, Casuarina glauca essence, Organic Olea europaea (Olive) leaf extract, Echinacea purpurea root extract, Chamomilla recutita (Matricaria) flower extract, Calendula officinalis flower extract, Organic Arnica montana flower extract, Organic Cera alba (beeswax), Carrageenan (Chondrus crispus)*, xanthan gum*, glyceryl caprylate*, bentonite (clay), sodium anisate*, sodium levulinate*, potassium sorbate, tocopheryl acetate (vitamin E), citronellol^, d-limonene^, geraniol^, linalool^. Below are reviews of Australian Bush Flowers Organic Woman Moisturiser - 50ml by bodykind customers. If you have tried this product we'd love to hear what you think so please leave a review. Bought this as a gift for my daughter. She loves it!